Oath of the Gatewatch, Mythic Rare. Let’s dissect this card into its component parts. First, we have a 5/5 for 5UU. That’s not terrible for a blue beater; rather, par for the course, actually since blue traditionally has the least mana-efficient creatures in the game as far as power and toughness are concerned. It has Flying, which is unsurprising but always welcome in an expensive blue creature. The sphinx has the handy addition of Hexproof, making it more resilient to your enemies’ removal and it is completely unable to be countered. So if you get this sucker on the stack, it’s entering the battlefield, no ifs, ands, or buts, and it is going to stay there for a while. All of that together makes me feel like we should keep an eye on it for standard. It could be a good finisher for control decks. Then there’s the gravy, that savory, delicious gravy. I doubted that the limited format would find much use for the creature (and I was right! 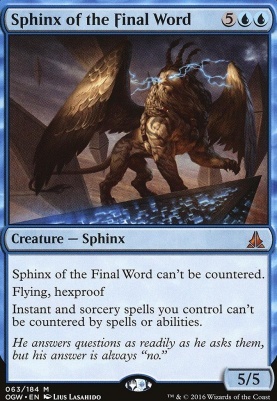 I mean, it’s a beater, but the gravy I love so much just sat there useless most of the time), getting to 7 mana is often a difficult feat, and I feel that if you manage to get Sphinx of the Final Word out in standard you’re likely in a winning situation and won’t need the last ability much. It’s in EDH/Commander that I see this card rearing its glorious bearded head and spreading those majestic wings. I’m trying to come up with reasons not to cram it in most of my blue decks and I find myself at an uncharacteristic loss for words to that effect. It’s just a big, dumb, good control card. Making your instants and sorceries unable to be countered is HUGE. I can’t tell you how many times my overloaded Cyclonic rift has been stopped by a lowly Negate. The sphinx gives you the ability to say “nope” to all of your opponents’ “nopes”.